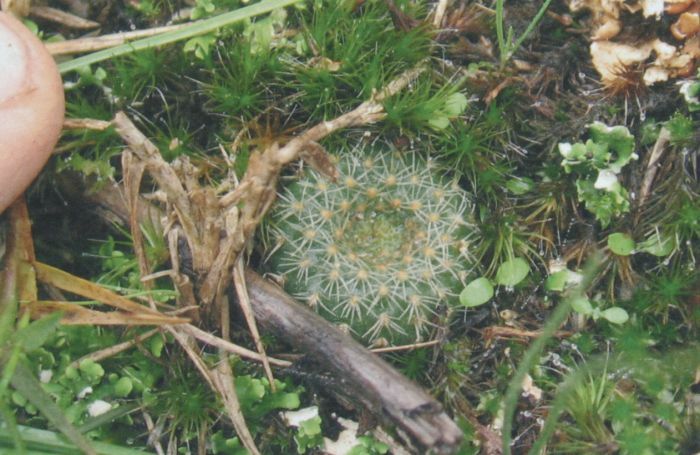 The first of a series of articles looking at some of the cacti found in Uruguay, with particular reference to the cryptic Frailea pygmaea which remains hidden during the dry season but stands out after the rains. Photography by the author. In the ravines near where I live and have my small cactus collection and nursery, in Barros Blancos, department of Canelones, Uruguay, there is a small population of Frailea pygmaea (Fig.l). Canelones is located in the south of Uruguay, and has an average annual rainfall ranging from 1200mm to 1400mm. As in the rest of the country, the rains are abnormally distributed throughout the year and are generally abundant in spring, autumn and part of the winter, but quite scarce in summer. 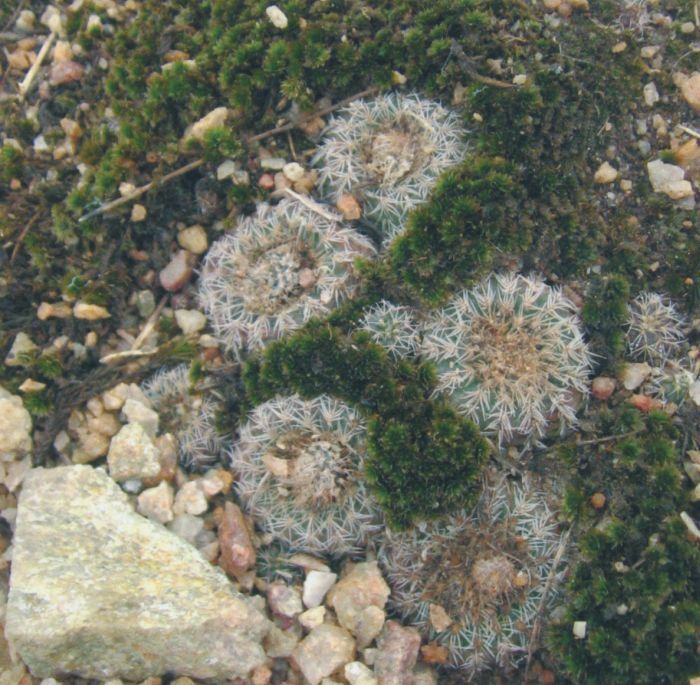 This pluvial variation also generates differences in growth, blooming and fruiting of the plants that grow here and, particularly, in the succulents that grow in these habitats. The countryside around my nursery is rocky, with sandy soil which also has a high clay content (in fact, the name of the town ‘Barros Blancos’ refers to this characteristic of the soil: Barros Blancos means ‘White Clay’, or ‘White Mud’). In the summer, higher temperatures cause the clay soil to dry up and crack, and the grasses almost disappear completely. The fraileas then partially shrink into the soil and hide among the selaginellas (spikemosses) and other mosses which envelop them. Spikemosses are among the few surviving members of the lycophytes, an ancient group of plants whose origins can be traced back as far as 400 million years ago. Lycophytes dominated the earth’s landscape during the Carboniferous Period (354-290 million years ago) and their remains can be seen and used today in the form of coal. Only three families of lycophytes survive today, including the Selaginellaceae (the spikemosses). In the autumn and in spring, when rainfall increases, the fraileas emerge again from below the surface of the soil, swell and stand out from the selaginellas and mosses that grow on the thin soil layer that covers the rocks (Figs. 2-3). 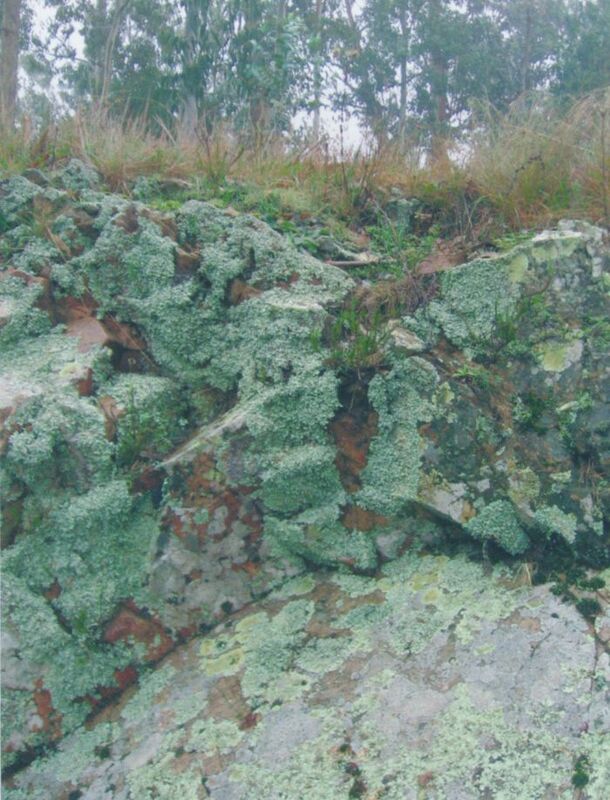 The selaginellas and mosses thus carry out a double function which helps the viability of the fraileas in this habitat, since in the winter months they protect the neck of the fraileas against contact with the excessively damp clay soil, which could easily cause the plant to rot. In the summer, on the other hand, they protect the fraileas against excessive drying- out and prevent the plants from scorching due to the high temperatures that the rocks develop in the sun. It is during this time of heat and burning sunbeams when they shrink among the very dry and spongy shafts of selaginellas. We have measured the temperature of the surface of these rocks in the summer and have recorded temperatures of over 50°C. In this habitat other succulents grow beside Frailea pygmaea. 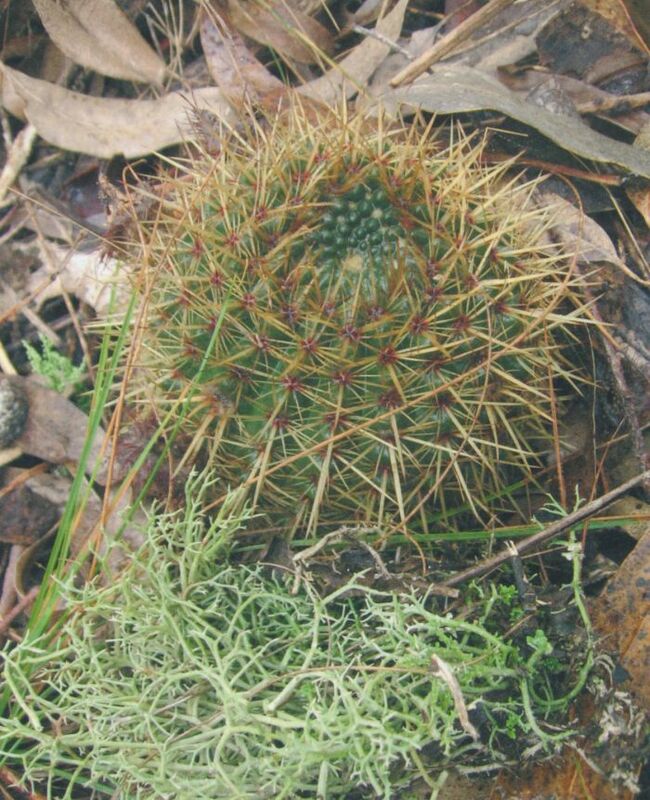 These include Euphorbia caespitosa, a local form of Wigginsia sellowii (Parodia erinacea) (which due to the nearby plantations of Eucalyptus have developed fungal diseases: in particular ‘Roya’ which is the Spanish for ‘coffee- rust’) and some scarce plants of Notocactus mammulosus (Parodia mammulosa) (Figs. 4-6). The euphorbia has a similar habit to the fraileas in that it remains hidden during the summer months, buried in the ground, and only puts forth leaves and branches when the rains reappear at the end of summer. 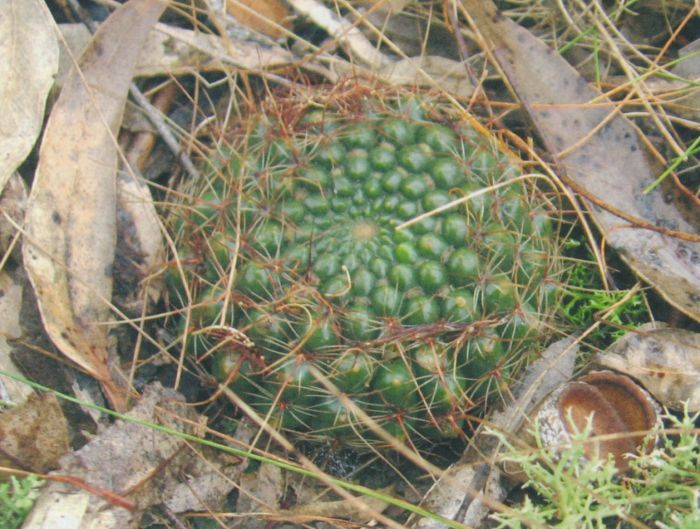 A local form of Notocactus concinnus (Parodia concinna) (Fig. 7), very scarce in this habitat, also grows in this area. 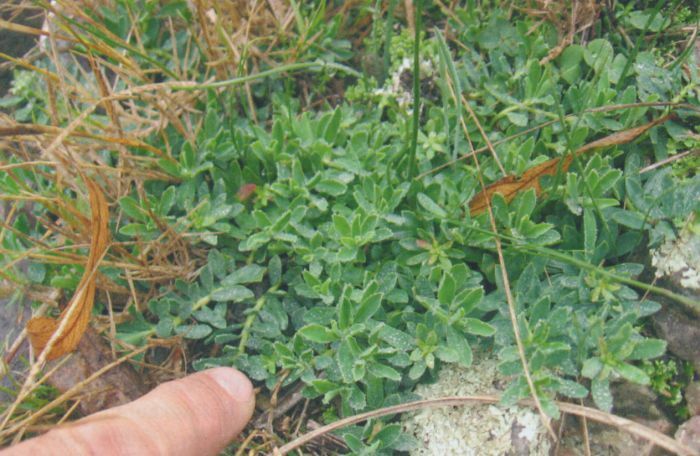 This plant can also be observed only at the end of summer, when it emerges from its hiding place among dried mosses and grasses, and it is particularly attractive in spring, when it develops its enormous flowers. 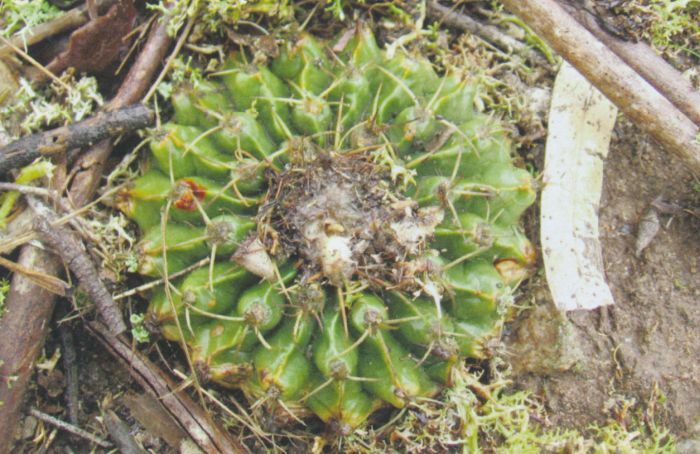 According to statistical data, this particular population possesses the biggest flower of all the plants of Parodia concinna which grow throughout Uruguay and Brazil. This large-flowered form, though rare, has an area of distribution of several square kilometres in the south of Canelones department, reaching the rocky hillsides around Arroyo Mosquitos at its northern limit. Fig. 3 F. pygmaea 'plumping-up' after the rains.